Texas Freckles: It's time to vote! I thought the Spoonflower voting was next week, but it's this week. It's time to vote! and it's called "Cheater Friday by melaniesullivan". When you click on my design, a green box will appear around it. Then, you have to click through to the last page and click the box to cast your vote. If you don't click the cast your vote button on the last page, your vote won't count. I noticed that all the designers are tweeting about their designs and they have 1,000's of followers on Twitter. Unfortunately, I don't Tweet, so I'm going to have to rely on your guys and just keep my fingers crossed that my design appeals to people! vote in!! Best of luck to you! Just voted for you...I can tweet it too! ok...just tweeted...only have a couple hundred followers...but hopefully that will help! Y'all are so sweet! Am I the last Twitter holdout? Maybe I need to get with the program! Good luck...I love your design! 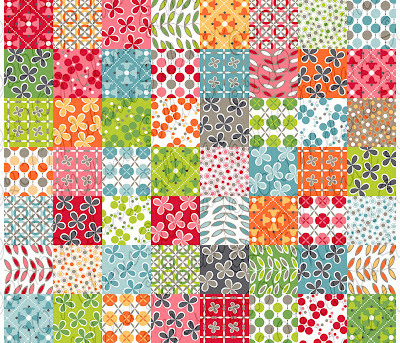 Wow, that was an interesting mixture of prints at Spoonflower.... Yours definitely stands out! I voted already for yours & it was certainly deserving! Lots of the prints barely looked like what I thought cheater prints were! Sorry, I don't tweet either! I voted for you too - yours was the best anyway! I've not got my head round this tweeting carry on either but I will try and remember to mention you on my next blog post! Voted for you!! I looked at them all and I would have voted for yours even if I didn't adore your blog. Yours is the winner hands down!! Glad you clued me in on how the voting works because that green box is not real obvious. Good Luck! you have my vote too! love the print! Voted for you. Love the fabric you designed! Voted for you! No tweeting here either. Voted. I would buy this fabric in a nanosecond! You just gotmy vote! Yours definitely stood out from the crowd! Good luck! You have my vote too ! I already voted for you!! I get the spoonflower link sent to me each week and when I saw yours, I thought... I have seen that somewhere already... It was one of the cutest - I hope you get it... if not, send it to MODA!!! It was most definitely the best one! what a cool contest! I love seeing the variety, so now I'm ready to vote. Good luck with your entry! You got my vote Miss Melanie! Good luck! I just love what you designed! Your design looks great, good luck! I voted too! Love yours the best anyway. Good luck. Voted for the most beautiful...yours!! Best Wishes! I voted for yours. Good luck. I'm voting for you right now! Yours is awesome, love it! I just voted. I do have to say yours was definitely my favourite! I got you!! Good luck, hope ya win!! Hi Melanie, just to let you know I managed to mention this on my latest post. I don't have 100's of followers but you never know, it all helps! Plus I am having a giveaway! I'm off to vote! Adorable fabric! Love it. I don't tweet either, so if that's how people win things these days I'm sunk. I voted for yours. Good luck! I voted for you fabric. It is so cute, I hope you win! voted for you and you alone! love the prints in this cheater. Yours should win! So pretty! Oooh, yours is by FAR the best print there, I'm sure that if voters are going by what they like the look of (rather than obligation voting) then you're in for a really big chance. Gorgeous, gorgeous design. Just voted, and would've voted for yours anyway. It is wonderful!! Great job!! I just voted! Even if you hadn't asked us to help out, I would have voted for yours. It's fantastic! Good luck! You won, You won !!!!!!!!!!! That is simply awesome !!!!! Congrats! It's even better printed out! I love this! This is exactly what I would make if I could quilt. I will be buying some. Now all I have to do is "stitch in the ditch"
I wish I had seen this in time to vote for it. What a fabulous print!! !